Thirty-seven Distinguished Members of the Hall of Fame have combined to win 40 gold medals, and gold medals won by Oklahomans Frank Lewis from Cushing in 1936, Doug Blubaugh from Ponca City in 1960, and John Smith from Del City in 1988 and 1992 are all on display. The four World Championship gold medals and the Sullivan Award won by Smith, who is the wrestling coach at Oklahoma State University, are also on display. The gold medal won and the uniform and shoes worn by Brandon Slay in 2000 when he orchestrated one of the biggest upsets in United States wrestling history can also be viewed. 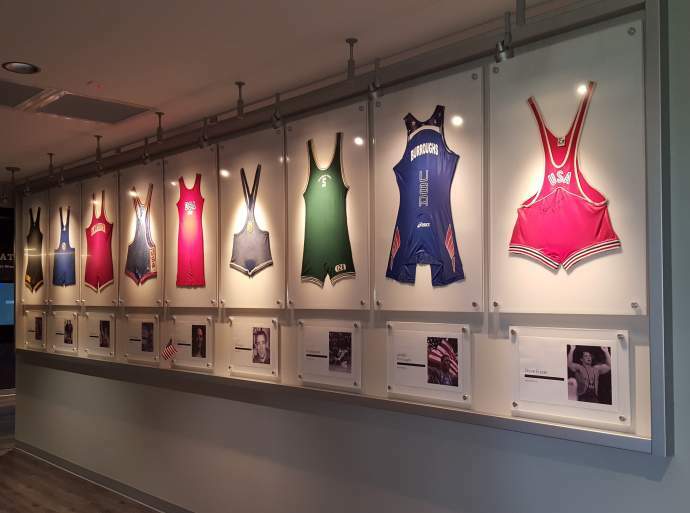 Boasting the largest collection of Olympic wrestling uniforms and memorabilia, the museum has singlets from current American Olympians Jordan Burroughs, who won a gold medal in 2012, Adeline Gray and Kyle Snyder as well as Steve Fraser, who won the United States first Greco-Roman gold medal in 1984, and Kenny Monday, who won a gold medal in 1988 and a silver medal in 1992. Children will be able to search exhibits for American flags, and earn a prize for completing the “Flag Find” and additional USA merchandise from Rudis and Cliff Keen has been added to the gift shop. There are portraits of 41 Americans who have won Olympic gold including Oklahoma natives Blubaugh, Kendall Cross, Lewis, Monday, Bobby Pearce, Smith, Jack VanBebber, Wayne Wells, and Shelby Wilson. Replicas of posters from 24 Olympic Games are featured as well as a collection of Olympic jewelry from two-time Olympic gold medalist Bruce Baumgartner. Baumgartner competed in the Olympics 1984, 1988, 1992 and 1996, tying him with Mark Fuller for the most appearances by an American wrestler. There is also a cabinet in the entryway that was crafted by Baumgartner. The lounge area has a floor to ceiling photograph from the 1960 Olympics where wrestling was contested outdoors in the world-famous Coliseum in Rome, Italy, and there is a collection of pins from Olympic and World Championships. The United World Wrestling area features an electronic kiosk with the UWW Hall of Fame, which honors the greatest names in the sport from around the globe, as well as memorabilia. Visitors can also visit the William S. Hein Library which has wrestling books from around the world, including several highlighting the Olympics. The NWHOF reopened in June following a $3.8 million renovation that included a complete demolition and rebuild of the interior. The museum now features interactive exhibits and electronic kiosks, as well as the opportunity to watch NCAA Championship matches from the 1930s to present day. Located on the corner of Hall of Fame Avenue and Duck Street, the museum is open Monday to Friday from 9 a.m. to 4:30 p.m. and on Saturday from 10 a.m. to 2 p.m. 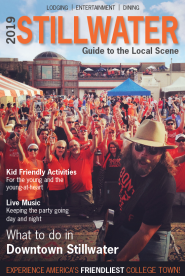 Admission is $7 for adults, $5 for military veterans and seniors (65 and older), $3 for students and $15 for a family. Children 5 and under and active military with an ID are free. For more information, visit www.nwhof.org or by telephone at 405- 377-5243.